Everyone loves the classic sugar cookie. My husband is a little picky though when it comes to a sugar cookie. He does not like them very thing or crispy. So I normally roll the dough rather thick and under-bake by a minute or two, they turn out perfect! The recipe I use, I’ve been using for about 14-15 years now. I keep meaning to ask my mother her recipe, the one we used growing up. I assume they are similar, if not the same as they seem to taste the same, to me. I can not get by only making 1 batch during the Christmas season, I make triple batches at a time! This year I’ve made more of them than any other year before. They came out so perfect each time and I love eating a few here and there myself. This dough is perfect to make the night before, the more chilled, the better! Beat butter & shortening on medium-high speed for 30 seconds. Add sugar, baking powder and a dash of salt. Beat till combined, scraping bowl. Beat in egg & vanilla. Beat in as much of the flour as you can with hand mixer, stir in rest of flour by hand. If you have a stand mixer you can add all the flour without needing to stir any in by hand. Divide dough in half. Cover & chill dough for 3 hours till overnight, or till easy to handle. On a lightly floured surface, roll half the dough at a time to ⅛ inch thickness. Use cookie cutters or biscuit cutter to cut into desired shapes. Place on ungreased cookie sheet. Bake in a 375 degree oven for 7-8 minutes or till edges are firm and bottoms are lightly browned. Cool on rack. Decorate however you desire. Sometimes, especially when making cookie cutouts, it is far to easy to use to much flour. 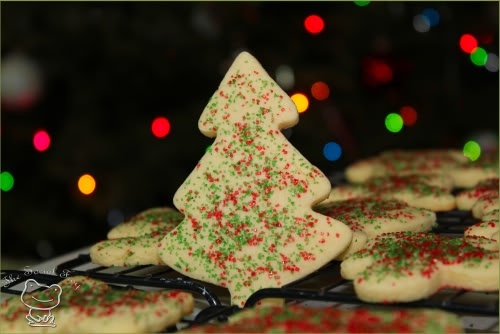 Using to much flour will most definitely keep the cookies from sticking but you will be left with a much tougher and undesireable cookie. To remedy this, it is best to roll your cookie dough between 2 pieces of waxed paper to ensure the dough will not stick and it removes the chance of a rough cookie!